Sensei-chan best girl. No wait, Hio-tan. Tsumorin! Erohon G-men? Too many choices! Denki-gai is a comedy about the otaku life, but it’s in the characters’ relationships that it really shines. I went into Denki-gai cautiously optimistic, so infected was I by takaii’s excitement in the fall preview, but without that I don’t know if I would have watched it, because each characters’ stated schtick—the Zombie Girl, the Manga Sommelier, etc—didn’t initially grab my attention. I wondered how they were going to build a story on such simplistic character traits, and worried that it, along with the tried-and-true-but-done-before otaku humor, would leave the show floundering before long. My fears were in vain. While I wouldn’t call the character complex, per say—this is still a comedy, so depth and complexity aren’t required, nor were they delivered—they’re not one-note characters either. Take Fu Girl: while her zombie obsession came up often enough, other times the jokes were focused on her size, shyness, her surprisingly foul mouth, or her relationship with Sommelier. And as I look back on the series now, I was never bored, and it never really slowed down, which is a hard trick for even the comedies I like to pull off. The other thing I thought going in was that it would be another harem show, with Umio as the leading guy. I don’t remember if it was the first or second episode that disabused me of that misunderstanding, but it was pretty quick. And thankfully so! Because week in and week out, my favorite thing about Denki-gai, and what kept me coming back time and time again, was the tiny hints of love between the characters. The teases! They kept dancing around it, giving us hope for Sensei x Umio, Kantoku x Hio-tan, Sommelier x Fu Girl, and even threw in some hints of wild cards like Kameko x Kantoku or Sommelier x Erohon G-Men. And Umio, who I started out thinking would be the harem lead—he’s just as eccentric as the rest of them. The delicate trick was in balancing a bias for the status quo—which is what most long-term comedies prefer, so they don’t wrap things up too quickly and lose a bunch of their jokes—with slowly developing the couples. By the end of the anime, each of the main ones actually made some progress, which was great! It’s slow, but as long as it’s going somewhere eventually, it’s not frustrating, and their rabu-rabu antics along the way are adorable. There is a certain amount of moe to the characters, particularly the girls. They’re all tiny, and while sexual dimorphism is a thing, and women are generally shorter, they’re … they’re just so small! But as moe as the art style is, the characters are, by and large, goofy adults. They live alone, they laugh, they drink alcohol—oh, the drinking of alcohol! I love it so—and they’re only childish insomuch as a bunch of die-hard otaku usually are. So they’re still moe, but it’s not the overriding flavor of the story to me. Your mileage may vary. Denki-gai is a rock solid comedy that I enjoyed every week. It’s not one I’d say that every anime fan has to watch, because comedies can usually be skipped without “missing” anything, but if you like comedy with a side of shipping, I recommend this series. There’s never a boring minute, and occasionally there’s a touching one. Now kiss, all you baka couples! I wrote a book! My first novel, Wage Slave Rebellion, is available now! (More info) My personal site has also moved. Last four posts: Interview with Little Red Reviewer, Sneak Peek: Wage Slave Rebellion prologue, Action Politics—a FREE short story, and Wage Slave Rebellion is available NOW!. ……oh well. I better stop. Oh, I agree. Honestly I just couldn’t think what to call the last section. It’s solid, but it doesn’t stand out enough to get the award. Definitely Nozaki. I damn near ruined a chair or two because of that show. Barakamon and Denki Gai were both cute, and both had their moments, but this was the year of the giant ribbons IMO. im loving the girl power skits…the mangaka girl is pretty gross with da wet-wipes and ramen…girl power -500!!! Yeah, the show is pretty inconsistent, but most episodes are good to excellent. Fu-girl has to be my favorite; her tiny shyness, general repulsiveness, and psychotic zombie destruction just works for me. I am hoping for a full length lime cat feature. Not directed by J.J. Abrams. I initially thought this was just going to be another “pervert humor” anime (which i’ve gotten incredibly sick of the past year (lookin’ at you, Seitokai Yakuindomo)) and didn’t plan on watching it, but at the insistence of a friend i gave it to try. safe to say, this show has delivered in heaps. I enjoyed the show a lot. It was a solid adaptation of a goofy manga I love to read. I wish there’ll be a second season… who am I kidding? ;_; I’m gonna miss this show. One amusing thing: Fu-Girl’s seiyuu, Taketatsu Ayana, also was the seiyuu for Sawatari Fuu in Tamayura. I found the casting kind of funny. From Fuu to Fu. 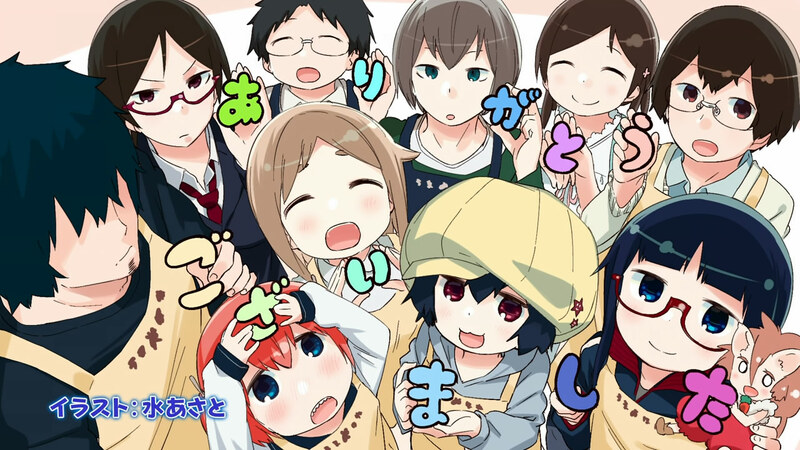 The thing about Denki-gai is that it’s about 60% comedy, 30% awkward (sometimes really awkward) romance, and about 10% wistfully sad/kind of painful (I want to just call it 切ない and be done with it, damn words that don’t translate well), and that’s a really good blend for me. And of course Kameko is best girl. I highly recommend picking up the manga from here on. There’s more stories to tell, more analyses of Girl Power, a new character or two, and the usual hijinks. I feel bad for Kameko, she is likeable but just got dealt a mehhh hand. regarding likeable “side characters”… sometimes I wonder if they would be as likeable if they got more spotlight and better luck. I mean I sympathized with her “unrequited love” situation and wonder if without it she will still got sympathy points. With all the gags in the show, I didn’t expect the little tearjerker moments courtesy of Tsumorin. Felt really sorry for her when she cried on Kantoku’s lap. Makes me wonder why they broke up in the first place, though Tsumorin going crazy during drinking sessions could be one of the reasons. I also wonder if that after credits scene with the baseball kid and the girl who walked pass him is supposed to mean something. Oh and for me Hio-tan is best girl followed by Sensei. It might be their personalities and circumstances. The show already tells us Kantoku likes teasing the girl he likes, and Tsumorin is a successful light novel author. So I have to say their relationship might not have worked out because somebody like Tsumorin is hard to tease or mess with and her career might have gotten in the way. Almost forgot to mention Ero Hon G Men as another favorite of mine in this series. I loved the series, so very much. It was good, but not Comedy of the Year good. Also, Ero-hon G-man the best. I assumed Ero G-Man was going to be a one shot character but I was so glad when she kept turning up. And Tsumorin was the best drunk. Agreed on both parts. I want to party with Tsumorin! She might give me a run for my money >:3 Though I’d prefer beer or whiskey to sake. Thanks for the closing thoughts Stilts! I too came back week after week to get my fill of the cast; Fu Girl and Sensei chan particularly. Tsumorin and Erobon G man appearances were near perfect and added so much to the laughter. Secondary characters get lost in comedies, but when these two made appearances it was golden! The Gman back story was great and Tsumorin…oh Tsumorin. SAKE FOR ALL!!!! Just rewatched the whole season. Man, these girls have big teardrops.